I genuinely enjoyed Rogue One. After The Empire Strikes Back, it is my favorite Star Wars film. There are however a few nitpicks I have about it. Some of them are the skin tone of Tarkin, Bor Gullet, planet cards, some of the soundtrack, no crawl, etc. Also, I plan to make this Episode III in the saga and create two Obi-Wan focused prequels (if possible or If I can stand them). Here’s a draft for a crawl. I also have attempted to introduce Krennic’s shuttle approaching Lah’mu to deal with the pan up situation. It’s still in draft form but here it is. 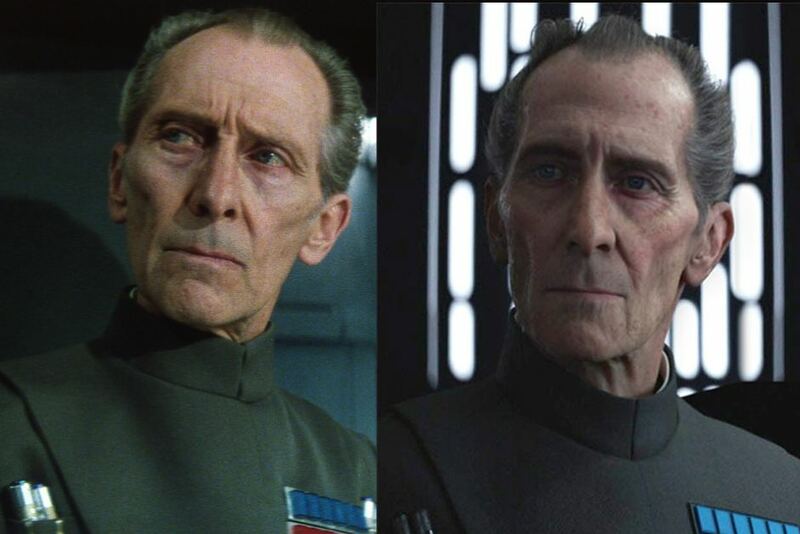 Tarkin looked off, understandably as he had a CGI face, but the flesh tones were off too. As you can see, Tarkin has more yellow in his flesh and doesn’t have that wet sheen either. While I couldn’t take out the sheen as much, I did apply a subtle recoloring to his skin using a secondary color corrector in Vegas (see video below). This was one of my first times using the secondary color corrector and I learned a lot. Due to the fact that the flesh tone mask bled over into the other faces on in the scene, this edit required extensive keyframing using a cookie cutter filter. The original version of this scene has the melancholy Rogue One que. I remember being enthralled by the visuals, but the music was just wrong. Here’s the original cut. And here is the rescored version using Giacchino’s Rebel theme. If you haven’t watched this awesome analysis of Giacchino’s Rogue One score, I’d highly recommend it. The idea of Giacchino using the Rebel theme at key moments of Rebel victory or introduction to connect to the OT guided my thoughts on this rescore. My thoughts on his score have greatly improved after watching this video and he’s brilliance as a composer has been reaffirmed. Imagine what he could do with a little more time. Here’s hoping we hear his music in the stars again. Please consider deleting “Episode III” from the Rise of the Rebellion crawl. Otherwise, viewers will initially think it is a Revenge of the Sith edit. Maybe you could insert “Story I”. Perhaps, you should leave it blank and omit any reference to its saga position, which could change in the future. We know there will be other spin-offs. So it is hard to know if it should eventually be called, “Episode III.I” or “Episode III.II”. Either way, please alter it. The intent is to use this movie as Episode III and create Episode I and II from the prequels. Thank you for providing an explanation. It may help viewers if you insert a simple message that explains the new saga sequence. Then fade to black for a 3 – 4 seconds before the famous, “A long time ago…” introduction. It will be cleaner that way and should avoid any confusion. I would like to see your cut list for the prequel edits. On IFDB, Octoroxx has some excellent ideas for parts I & II, which they have borrowed from other editors. I think Octoroxx is still working on part III. You might want to share some ideas together. Have you seen Jeremy M. West-Esquire’s Anti-Cheese edits? He worked wonders with The Phantom Menace and it is my favourite of his three efforts. I was impressed by the way he raised the pitch of Natalie Portman’s voice. She became far more sympathetic. I wish you good luck with Rise of the Rebellion. I really enjoyed Heir to the Force! Thanks BRAINYBRAD. I too am a fan of the anticheese edits. One of my favorite episode 1 edits is secior’s Return of the Sith. I’ll look into Octoroxx’s lists and see what I might borrow. This edit is almost done. I may make a post about episodes 1 & 2 to get ideas from everyone. Thanks again for your thoughts and interest. If I was able to achieve it, I would make it a separate option. Where do i DL your edits of Rogue One & Ep 7 (Star Wars) ?? Hi, I’ve sent you a few messages but you didn’t respond… would be great to get a link. I watched your edit yesterday and I like what I saw but I already liked the original so I don’t have anything bad to say about the edit, except maybe for the title “Rise of the Rebellion”. In my opinion, “Rogue One” sounds better since the rebellion is already in operation so there’s no “rise” at all. Thank you again! Thanks again for watching my edits and sharing your thoughts. I too liked the original cut. I felt like the Rebellion wasn’t fully functioning in this movie. Yes they had formed, but they weren’t unified enough to be a legitimate threat. Rogue One is that moment when they cross over from being a bunch of separatists (in the eyes of the Empire) to becoming a revolutionary force to overthrow the Empire. Rise of the Rebellion was chosen to symbolize that final step. Making the film more serious is exactly what it needed, but there does need to be a little humor here and there to break some tension. Thank you for removing the cameos. They always seemed to break the movie for me. I’ll be keeping this one to watch in place of the original from now on. Are you going to correct the position of the Death Star? The Jedha scenes keep showing it upside down even though people say there’s no such thing in space. No. As you said, that would assume there is a right side up in space.